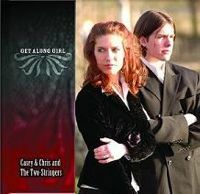 Get Along Girl: Casey and Chris and the Two-Stringers made an impact with this, their only full-length CD. Fans especially like Casey and Chris Henry's sibling harmonies and fresh original material. This release is packed full of Chris Henry's own songs, two of blazing instrumentals, and a couple classics pulled from the Red and Murphy catalog. Along with Casey (banjo), and Chris (mandolin), Tyler Grant on guitar, Missy Raines on bass, and Shad Cobb on fiddle round out the band. WE ARE OUT OF PHYSICAL COPIES OF THIS CD. However, it is still available via download, either individual tracks or the entire album. Please use the buttons below. They will take you to CDBaby or iTunes and your digital music purchase will be completed through their website. Two Hands On The Wheel, Walkin' West To Memphis, Going Back To Old Virginia, Sound I Hear, Leroy And Liza, One Foot In The Graveyard, Counting On The Stars, Hold Back The Waters, Change Of Heart, Pass The Eagle, Sad Woman From The Country, Pitiful Life, Got Sweet Heaven In My View. Bluegrass Unlimited, September, 2006: Here’s a nod of appreciation to Casey and Chris and the Two-Stringers’ debut album, a nod to the sheer exuberance of the performances, to the shoulders back, let-it-go spirit that it embraces. To be this soundly traditional and yet make the use of said tradition sound lively and fresh takes living close with the form, and it is apparent Casey and Chris Henry have lived so. Casey brings a clean, bright approach to her banjo, very much Scruggs but with some modernistic touches that show life continued past 1955. Along with a consistency of tone and technique from solo to solo throughout, she contributes an original instrumental, “Leroy and Liza,” enlivened by surprising chord changes, particularly in the bridge (knowing it was inspired by Frank Wakefield explains much about its structure). Vocally, Casey has an emphatic lead and a pleading tone well-suited to tunes such as the 1928 Florida hurricane ballad, “Hold Back the Waters,” and to Sally Jones’s modal “Sound I Hear.” She’s almost defiant on that latter number, and you can hear the disgust the song’s narrator has with her roving husband. Chris has obviously studied deeply Monroe’s mandolin style and has absorbed well what he found. Monroe technique requires a fluid picking hand; Chris has that and with it a fine sense of punctuation and fluidity that gives his work a buoyant quality. More impressive, however, is his ability as a songwriter. His five string tunes here each sound like bluegrass/country long-ago, and he shows a fine way with the turn of phrase, as in the line from the bluesy “Walkin’ West to Memphis,” in which he rhymes Nashville with goin’ where the cash will. In “Pitiful Life,” to cite another example, he writes …boy falls in love, and she crumbles his world. It’s not Shakespeare, granted, but in the context they catch the attention. All of these he sings with a smooth mid-range tinged with a touch of wink-and-grin slyness.